Little banana rolls that are perfect for breakfast or a healthy snack. Only three ingredients. Easy, gluten-free, dairy free, vegan, and super delicious. Spread a banana with almond butter (or your favorite nut butter). Roll it with toasted coconut flakes (or your favorite toppings), making sure all sides are covered. Serve right away and enjoy a delicious and healthy treat. You can use peanut butter, almond butter, or cashew butter. Choose other toppings for different flavor combinations like: chocolate chips, granola, cereals, or almonds. 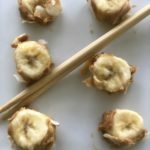 Try your banana sushi with these training chopsticks for children, they are so much fun!